In 1910, Armand Deperdussin founded the Societe Provisoire des Aeroplanes Deperdussin (SPAD). The company built racing airplanes designed by Deperdussin; a monoplane designed by Chief Designer Louis Bechereau in 1913 set a world air speed record of 125 m.p.h. that year. In August 1914, Deperdussin was arrested for embezzlement, but was released a month later without a final judgement (he was finally sentenced to five years in March 1917 but never served his sentence) due to the importance of his company and its products following the outbreak of the Great War. Louis Bleriot became President of the reformed company, now known as the Societe Anonyme pour l’’Aviation et ses Derives which allowed them to keep the SPAD. Most importantly, Bechereau was retained as Chief Designer. After designing the odd-looking SPAD A.4, a two-seater “fighter” in which the gunner sat in a “pulpit” immediately ahead of the propeller, Bechereau next designed the SPAD VII C.1, which utilized the 150 h.p. Hispano-Suiza V-8, armed with a single Vickers using the Constantinescu hydraulic gun synchronization system. Introduced to combat in August 1916 in limited numbers shortly after the appearance of the Albatros D.II, the SPAD VII would be an important part of the French and Italian air forces for the rest of the war. At first, the airplane was faster than the Albatros, but not as maneuverable as its main opponent. With the later 180 h.p. Hispano, the SPAD VII became not only faster but more maneuverable. In 1917, Bechereau designed the definitive SPAD XIII C.1, using the superb 220 h.p. Hispano-Suiza, which allowed an increase in armament to two Vickers machine guns. While the airplane did reach the front in limited numbers in the spring of 1917, difficulties in production, coupled with the necessity of a redesign of the upper wing, meant that it did not reach the front in appreciable numbers until late 1917 and did not fully replace the SPAD VII until the spring of 1918. The SPAD XIII could not have arrived at a better time, as the last six months of the war saw more intense combat than the previous three and a half years. The SPAD XIII could fly and fight at altitudes approaching 20,000 feet, where air combat was now taking place, and could hold its own with the superb Fokker D.VII. 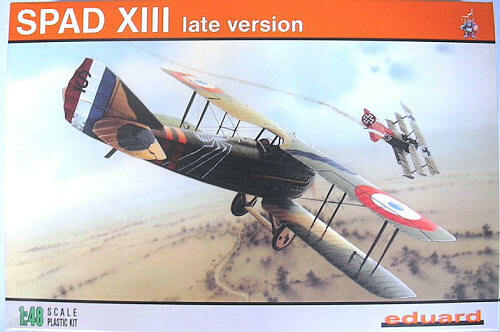 Every great French ace flew the SPAD XIII, which also began equipping squadrons of the U.S. Army Air Service in July 1918, where it saw outstanding service in the three months of fighting in which the American forces demonstrated they were the equals of their European allies and enemies. After the war, the SPAD XIII was used by air forces ranging from that of Czechoslovakia to Japan, and remained in first-line service with the U.S.A.S. until the early 1920s. Opening the box, one will be immediately aware that this is one of the best World War I kits yet produced. 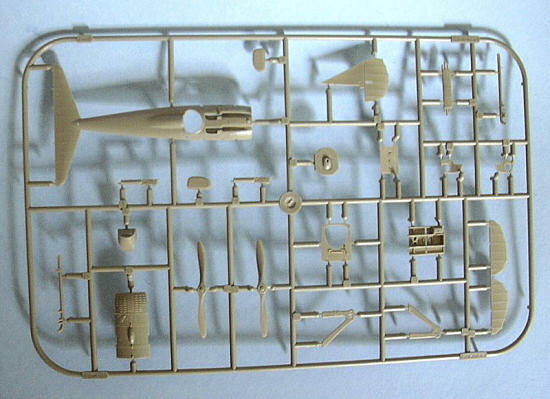 Three tan colored sprues present a total 85 plastic parts, which are supplemented by three clear pieces for different windscreens, a masking set and a pre-painted photo-etched fret with 29 detail items. This is definitely NOT the DML kit. For one thing, the poor photoetch interplane struts of that earlier kit are replaced here by petite three-dimensional struts that are just right. I particularly like the fact that the horizontal stabilizer is molded with the upper rear fuselage, allowing it to be perfectly thin, with a strong part that won’t break. 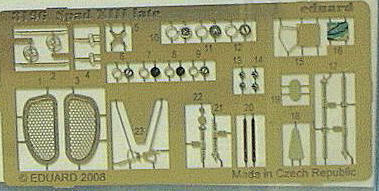 (That is the sprue shown. Ed) In particular, this upper rear part being one piece means there is no possibility of losing the stringer detail when the fuselage halves are joined. The wings are suitably thin with a very good representation of fabric over the ribs. The smaller details are excellent, and while not all the parts can be used in this particular release, a modeler who has the Windsock Datafile and other decals can pretty much do any late-production SPAD XIII they wish. I particularly like the inclusion of both single and two piece cowl arrangements as well as two types of airscrew - the 250 ØØ Éclair series 153 and the Gremont propeller. The SPAD cockpit was “busy” and Eduard has really caught this. 30 parts, including instrument dials, seatbelts and even a map from the photoetch fret. The result will be one of the best cockpits on any WW1 model. And OOB! 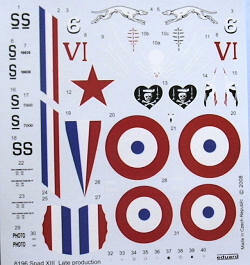 Decals are provided for four aircraft: Sgt Fernand Chavannes, SPA. 112, August 1918; Lt Charles Nungesser, Escadrille SPA.65, September, 1918; Adjutant Marius Blanc, Escadrille SPA.81, Summer, 1918; and Capitaine Rene Fonck, Escadrille SPA.103, Fall, 1918. I particularly like that the markings instructions show the subtle yet important differences in the camouflage patterns, since all of these aircraft are from different manufacturers. I have liked the SPAD XIII since I first saw the famous picture of “Captain Eddie” Rickenbacker standing next to his, as a child. I’ve built every model of the SPAD in every scale, going back to the ancient Hawk release (still available from Testors 55 years later), and this definitely looks to be the best of all. I really like the fact that now, with an Eduard kit, one does not have to go searching through the aftermarket to get details and decals - particularly now that aftermarket decals are becoming as scarce as the proverbial hen’s teeth. The rigging is complex but not difficult. Highly recommended to those who have built a couple WW1 biplanes before.